One strategy to deal with the current market turmoil is called down-day covered writing. This is based on looking for stocks that are down on a day that the market is down. This strategy assumes the rubber band reaction of the stock bouncing back up when the market move up. This gives the writer the advantage of buying the stock at a cheaper price than on a market up-day. On a day with a big pullback, you are trading a lower premium for the potential capital gain of the bounce back price. For example, a stock is trading at $45 and the current month 45 call is priced at $2.10 indicating a cost basis of $42.90 and a assigned return of 4.9%. However, on the market down-day, the stock drops to $43 and the 45 call price drops to $0.90. If you enter this trade by buying the stock at $43 and selling the 45 call for $0.90, your cost basis is now $42.10 and your assigned return is now 6.9%. If the stock falls short of $45 at expiration, you keep the $0.90 in premium and write a new 45 call at the next expiration date. The key to this strategy is making sure the stock is trading with the market. Here we will define the market as the S&P 500. Use a chart service such as bigcharts to create a chart with your stock. Then click the compare buttom to add the SPX (S&P 500). 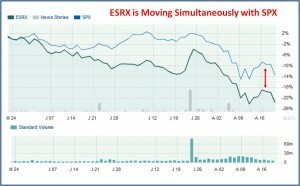 See chart below of ESRX compared to SPX. 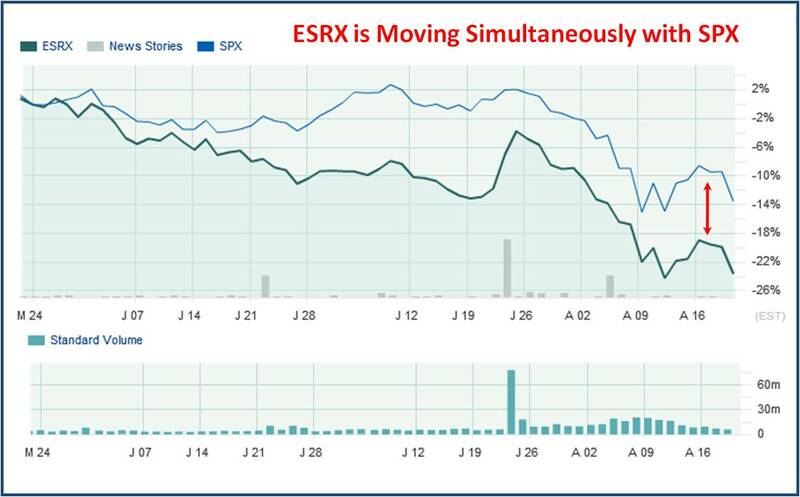 You should notice that the stock and SPX have a very similar pattern. If yes, the two are moving in lockstep together and this is a good candidate for this strategy. This strategy is not about the technical movement of the charts but about the potential snap back movement of the stock. This serves as an example of why covered call traders sell out-of-the-money (OTM) calls to increase return on investments.